Two years ago, on 21st Septmeber, I joined Etsy. Soon, it will be my second "Etsyversary"! 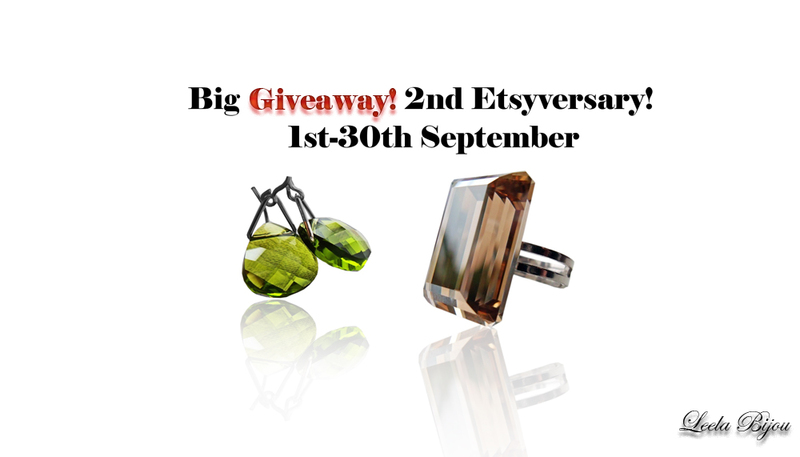 And the same way I did last year, I´m having a big Giveaway this month too! All made with Swarovski crystal and sterling silver! ~When is the limit date to enter? There are several ways, and you can enter more than once! Note: newsletter subscribers will have 2 entries (current subscribers and new ones)! I am pretty facebook dumb...and don't see the "like" button there...maybe I've liked you already? Congratulations on your second Etsyversary! 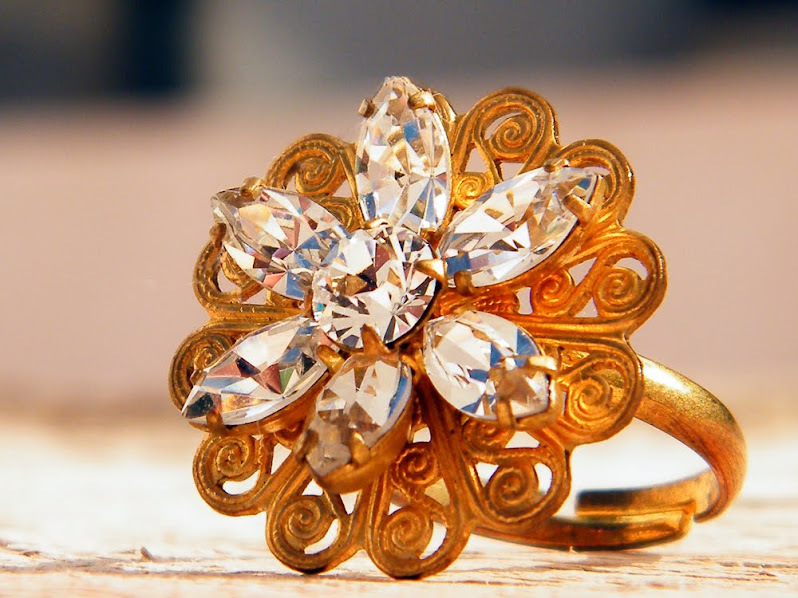 I am loving this ring!!! Gorgeous!!! So hard to choose. I love the summer sun ring, the bouquet of roses necklace and the rose hair clips. I think the rose hair clips are probably my favourite. I can just see a bride wearing them. I'm already a blog follower and a facebook liker! The Keys To My Heart - Silver Plated Chain is so adorable! Thanks for the chance and congrats on your Etsyversary! Happy Etsyversary! My favorite piece in your shop is the La Vie In Blue Bracelet! Beautiful. Thank you for the chance. I LOVE the Golden Leaves Tiara - Headband Swarovski Crystal. I'd wear this all the time. I love the green petal bracelet. Congrats on 2 years! I love the blue hair pins! I now follow your twitter. I like Set Of Four Hair Clips - Blue And Violet cindyhinckley at msn. I love the Insomnia earrings! Enter me please! My fav item is The Roses Garden Necklace - Lariat. The Kara ring in Gray is my favorite! I love to visit your shop! :) Always something new to oogle at. My favorite is the Fairytale necklace. I love this:.Lyris Necklace I am trying to collect red jewely for my daughter and this piece is just lovely! I like the Kara ring in gray. So cute! i would love Velvet Crown Ring - Swarovski Crystal Sterling Silver . Wow, 2 amazing years and still counting! Congratulations! I simply adore the La Vie in Green Bracelet, it's so gorgeous! The swarovski crystals are absolutely stunning, truly a masterpiece! Thanks for the lovely giveaway, the ring and earrings are so beautiful. #1 I subscribe via email, thank you. #2 I subscribe via email, thank you. I love the The White Swam Necklace (Lariat), absolutely gorgeous! I like your fb page, Daeron Mel. I subscribe to your newsletter at daer0n_ at hotmail dot com. I follow your blog on google friend connect as daer0n. I like the luxury red necklace! I love your Red Hearts Earrings! I am following you on twitter (@feefeegabor) and on FB (Fee Edwards MSE) and have signed up to your newsletter! I love the Chocolate Ring and also the Red Roses Ring. Congratulations on your etsyversary! I am glad I found you! "Like" you on FB and commented on your wall. My FB name is Vicki Sh. Now following on GFC, my name sswpss. I love the Exotic Flavour Bracelet - Green Mother Of Pearl. 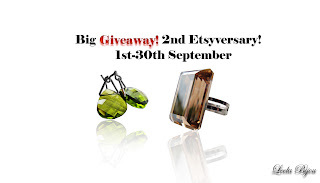 Great giveaway and congrats on the 2nd Etsyversary! I like your Golden Leaves Tiara Headband - Swarovski Crystal! I like the cream crystal pearl earrings the best. i looove "courage" from the emotions collection! Love the Golden Leaves Tiara, so pretty and different. Congrats on the anniversary (that's my birthday, too, haha)! I love the Rose Hair Clips - Set Of Eight! do u need our emails? congrats! I hope to be in the same etsy anniversary one day soon! I love your Electric blue earrings here http://www.etsy.com/listing/39206366/electric-blue-earrings-swarovski-crystal They are so eye-catching and im really loving chunky studs at the moment, FAB! This was SUCH a hard decision... I love all of this jewelry - especially the hair pins!!! 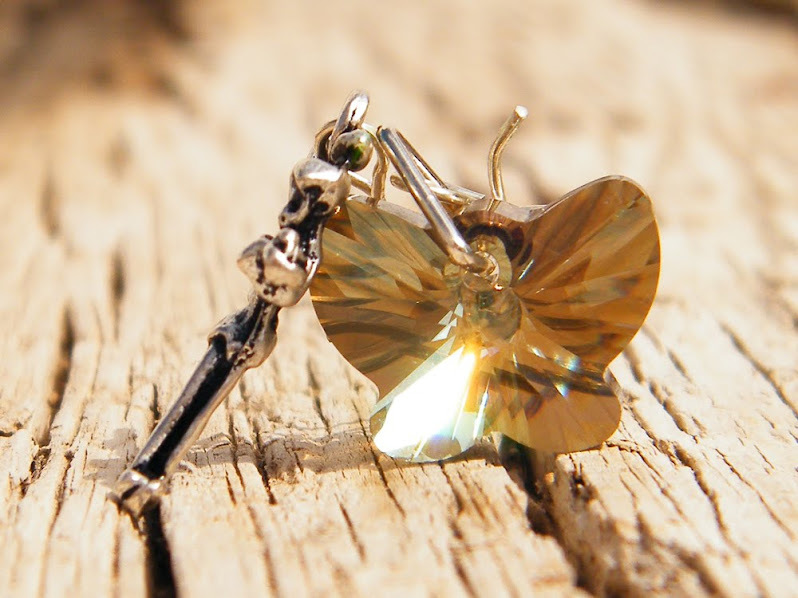 But then I saw this... http://www.etsy.com/listing/37502566/emotions-courage-necklace and I fell in love! I love the colors that project from it!! My favorite is the Venus Heart Necklace - Swarovski Crystal Silver Plated. Love this White Flower Necklace - Swarovski Crystal Sterling Silver. I just loved the Lys Ring - Swarovski Crystal Sterling Silver. My favorite is the Blue Briolettes Earrings! I really love the "Velvet Crown Ring". I like the Black Panther Ring. I love the Velvet Crown Ring - Swarovski Crystal Sterling Silver! Loved the set of six purple hairpins - they were adorable! Now subscribed to the newsletter. I follow you on Facebook, mine is www.facebook.com/aspiringimagesbyrachel & twitter (I am www.twitter.com/aspiringimages). Also subscribed to your newsletter. Last but not least, I follow the blog through Google Connect. First: your Spiga Pendant is my favorite item. It's INSANELY gorgeous. 2nd: I just subscribe to your newsletter. 3rd: I am totally a follower via google. My favorite item is the Green Petal Necklace, followed closely by the Lys Ring. I love the Back To Nature Necklace - Turquoise! Thanks for the chance to win! Also subscribed to the newsletter. And liked on facebook (Randi Moulton). I love every rings!! !I'in love with the rings!!! 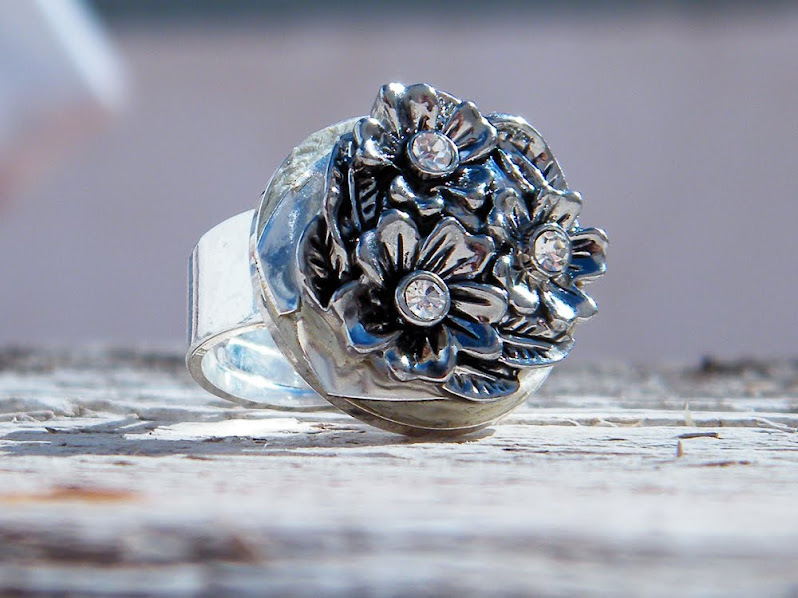 I like very much Asymmetric Ring - Swarovski Crystal Sterling Silver! !it's beautiful. I love the Red Eye - Crystal Golden Plated earrings. You have so many beautiful items in your shop, it's amazing! I love the Elegant White Crystal Bracelet - Swarovski Silver Plated. So pretty!!! Such lovely creations! I really liked the Green Petal necklace from the romantic collection...so pretty! I love the Venus Heart in Red Necklace. I fanned your FB page (Suzanne Gregg). I love love love The Queen Ring - Fuchsia Swarovski Crystal Sterling Silver!!! soooo beautiful!!! and the white opal http://www.etsy.com/listing/32219393/white-opal-earrings . I simply love the Iceberg Ring!